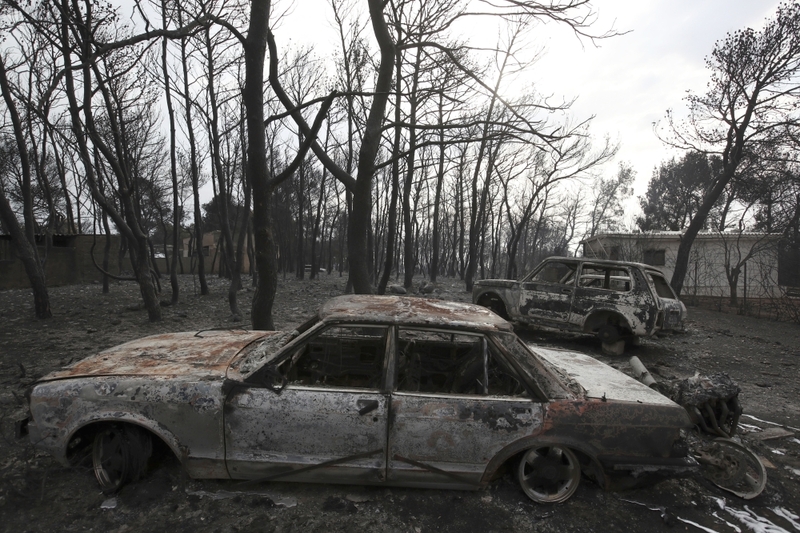 The prime minister of Greece pledged Thursday to overhaul the national disaster response agency as authorities publicly named the people killed by the country’s deadliest forest fire in decades — victims whose ages ranged from 6 months to 95 years. The list, which included four families, was longer than it would have been a day earlier. A 78-year-old woman died Thursday of injuries from the July 23 fire, bringing the death toll to 93. Most were Greek, but there were also two Polish citizens, a man from Ireland and a man from Belgium. The woman who died Thursday was the 10th person to have died in a hospital from injuries sustained in the fire. Another 34 people remain hospitalized, six in intensive care. More than half of the dead were over 60, the government’s list revealed, and included grandparents who perished with their grandchildren. The victims also included five members of the same family — a 39-year-old chef, his wife, 38, their two children, ages 4 and 7, and the chef’s 67-year-old mother. In all, 11 children died in the fire. Among them were two sets of twin girls, and the 6-month-old son of a firefighter who was called to duty that day and whose wife also was killed. Tsipras mentioned the firefighter, Andreas Dimitriou, during his speech Thursday to senior police and fire service officials. “We must take all necessary measures so that we never again experience such a disaster,” he said. Tsipras said the country’s General Secretariat for Civil Protection would be replaced by an agency that brings together security forces, the military, health services, academics and volunteers. The role of the new National Agency for Emergency Management will be to organize disaster prevention efforts, to coordinate the responses to emergencies and to oversee the reconstruction of stricken areas, he said. Setting up the new agency will cost about 500 million euros ($577 million) and be paid for by national and European Union funds, Tsipras said. The prime minister’s left-led coalition government has been criticized harshly for its handling of the blaze, which broke out as firefighters were battling another major fire west of the Greek capital. Critics have focused on the absence of an official evacuation effort, the alleged lack of coordination between state agencies charged with handling the emergency, and the alleged directing of motorists by traffic police toward burning areas. After nearly two weeks of maintaining that everything was done correctly, Greece’s public order minister resigned last week. The heads of the national police, the national fire brigade and the civil protection agency were replaced shortly after. A judicial investigation into the cause and the handling of the fire is underway. Authorities have said initial indications are that the blaze was ignited accidentally by someone burning garden waste. Tsipras said he asked a leading fire ecology expert, Johann Georg Goldammer of Germany’s Max Planck Institute for Chemistry, to form an international committee that will examine underlying causes of the wildfire and recommend ways of preventing future disasters. The prime minister said Goldammer, who also directs the Global Fire Monitoring Center, was picked to ensure “there is no question of the committee’s impartiality,” and has agreed “in principle” to the request. The government — in power since 2015 — has mainly faulted illegal building and poor planning in the hard-hit resort village of Mati for the high death toll, squarely laying the blame on previous administrations. Officials have promised to demolish dozens of illegal constructions, largely private fences and walls blocking access to the sea.